At Henley Primary School our day was divided into four parts by morning recess, lunch and afternoon recess. After recess breaks we didn’t just walk into class, we had to line up outside the main door and when the teacher told us to enter we marched inside. After lunch each class lined up in their allocated spot on the big quadrangle. The band was all set up but I can’t remember if it was out the front or at the back. Whatever instructions there were for the day were given out then the headmaster signalled the drummer to let us know it was time for the band to start playing. Everyone else began marching very smartly, in their lines, back to class. The band was made up of a Bass Drummer, two Kettle Drums and the lines of fife players, the drummers were always in the lead spread out across the front. The only two tunes I can remember that we played were, “Men of Harlech” and “Colonel Bogey” but I’m sure there were plenty more. Practices were held in the Lunch Shed. Only boys played the drums but one day the drummers were all away somewhere and I remember feeling very excited at the prospect of being able to play a drum. When the time came I think younger boys took over the responsibility but it could have been very confident girls, I was very disappointed at missing out. You didn’t know that about Nana did you? 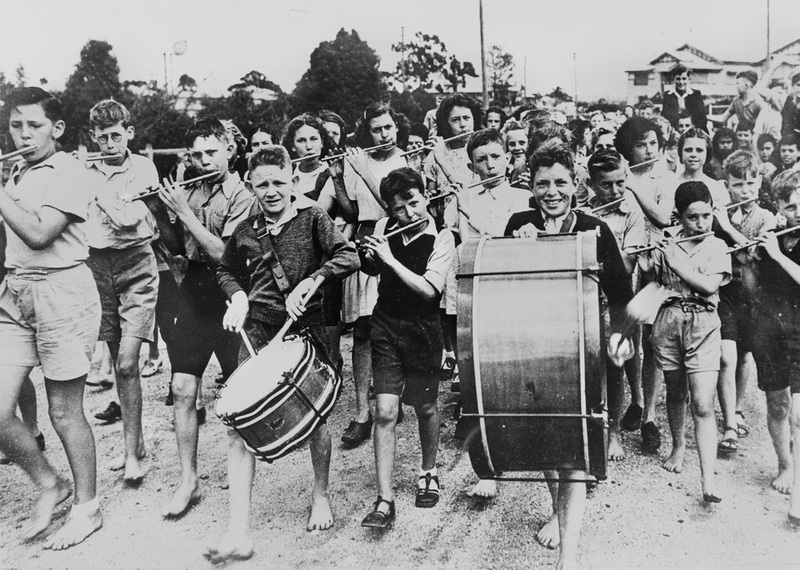 This isn’t our band, it’s the Moorooka School Band but apart from the bare feet they look just like we did I’m sure. 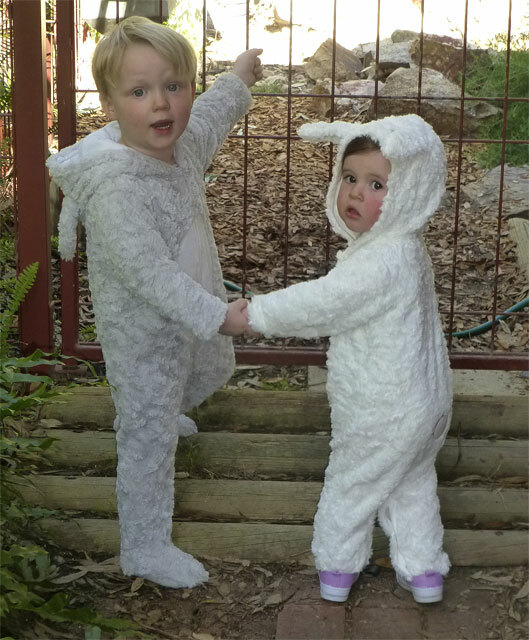 Having just spent a lovely Easter Sunday watching kids having fun searching for eggs I’ve been reminded of past Easters. Mum didn’t believe in Easter Eggs so the only time we had any as kids was the year she was away holidaying in New Zealand at Easter. I remember waking up in my nursery bed, which had little sides near the head end and resting on the ledge that the side provided was a chocolate chicken. I must have been only about 3 then but I remember it after all these years as a very happy time. Growing up we attended what seemed like very long Easter church services and between the ages of about 9 and 12 the horror of human cruelty, so blatantly portrayed at Easter, really tormented me. I’m glad I can now spend the Easter break in a way that rejuvenates me. Here in Australia we’ve recently had another politician shamefully resigning from his leadership position. It seems that politicians lie more than the rest of us probably because they’re in the public eye so we see it but it could also be because their egos are so big it’s beyond their comprehension anyone would question them. In this latest case it started with a gift of a bottle of wine, not a delightful “Annie’s Lane” from Spud Sullivan’s but a $3000 bottle of “Grange Hermitage”. When they recovered from the fact that someone would pay that much for any drink I think most people would just accept the fact that someone might try and gain favour with an influential person. If the recipient is honest they don’t have to do anything other than enjoy the drink. What destroys people’s faith is the continual lying, even under oath, until accepting the truth is the only option. At that point there’s no way resigning or admitting the truth is seen as honourable, it’s too late. More than the initial transgression we remember the waterfall of lies and how can you believe anything they say after that? We all need to trust others in our daily living and to do that we need to know that what they tell us is the truth. When I was growing up I didn’t get pocket money but more often than not I did get lunch money. There was a little shop next to Henley Beach Primary and that’s where we could get our food, we could order it in the morning then pick it up at lunch time. People who never do it think buying your lunch is great but I can’t ever remember being excited about it. At one stage the shop sold Sherbert Icecream and it was much cheaper than other icecream. A double icecream usually cost 10 pence which is less than 10 cents (if you ignore inflation). Some people said it was cheap because it was normal icecream gone wrong and they made it into sherbert, I had no idea if that was true but liked it anyway. One day instead of lunch I bought a double Sherbert Icecream. I must have been late getting it because the bell went when I still had the whole thing. No way was I going to throw it out so I sneaked it into the classroom and hid it in the desk. 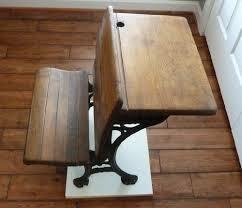 The desks we had were double ones. The back of your seat was the front of the desk behind, the bench seats flipped up and the desk top sloped with a lift up lid. I kept my left hand with the icecream under the lid then lifted it and dipped my head down to eat the icecream. The raised lid hid my face so I managed to eat the whole thing without being sprung. We probably had at least 40 kids in the class and I was near the back so that would have helped. This is only half the length of the ones we had, the seats had a nasty habit of falling back with a BANG! 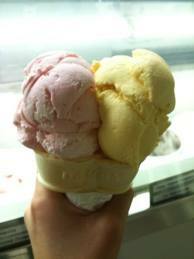 It’s not sherbert but it is a double cone. I just don’t understand it, gravity makes everything head to earth doesn’t it? As I’m ageing gravity seems to be the cause of facial features I’d rather not have taunting me in the mirror. The excess skin on my neck, which appeared from nowhere, is heading towards what would be my mammary gland mantelpiece if I was willing to suffer “uplift bras”. My starvation-prevention-reserves always relocate south and my doctors have scared me with stories about bits which might drop out if I don’t create a cast iron basement. Why hasn’t the skin on my legs decided to collect in wrinkles around my ankles? Why do my feet look like those of a 17 year old when, unlike my face, they haven’t been nourished by an array of “age defying” creams and serums? Is that noise I hear Mother Nature chuckling? The first home I lived in was at Henley Beach and one year our family was going to house swap with one of Dad’s friends from the war. We were supposed to go to a farm somewhere in the south east, maybe around Penola but my Nana was sick and we couldn’t go. Because the other family were coming up we went to stay in a big shed that Dad had built on a block we owned just about opposite where Henley High School is now. There was a caravan parked beside the shed. 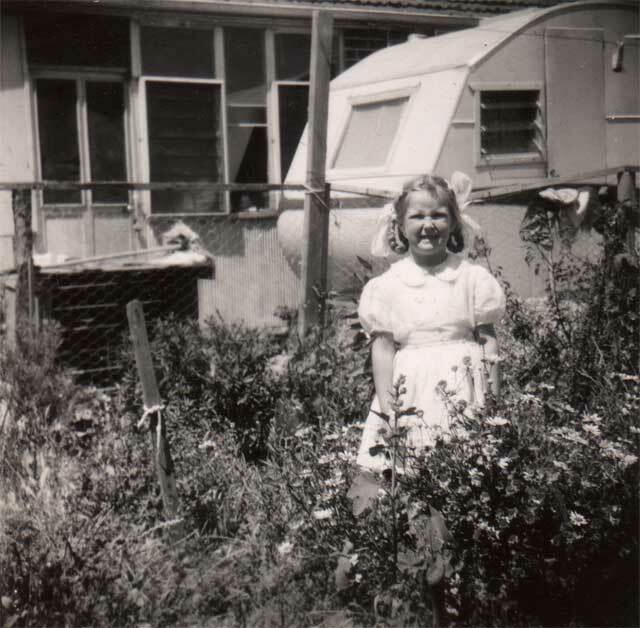 I was 5 or younger at the time so Jaynie was only 2 and one day Mum left us sleeping in the caravan when she walked down to the shops. Fry’s Butcher shop, Edna Dunnings shop and I’m not sure what else was at the corner of Military Road and Henley Beach Road which might have still been called Adelaide Road at that time. Newcombes’ shop was on Seaview Road at the top of the sandhill, they sold newspapers and I don’t know what else apart from firecrackers in November! Before Mum came back we woke up and it was dark in the caravan so I tried to light a candle. I tried and tried but just couldn’t get it lit. I guess I dropped the matches as I tried until I became aware of the mattress smouldering. I ran off to find Mum and met my brother, Ricky, coming back on his bike. He asked me why I wasn’t at the caravan but we didn’t get along and I wouldn’t tell him, I just asked him where Mum was. The rest I don’t remember but Jaynie didn’t get burnt and the caravan survived so we must have been very, very lucky. My posh frock and ribbons don’t quite match the rather shabby setting. If Mum took the photo she would have been seeing only the flowers. Last week I was babysitting a sick grandchild and thought a little TV might be a distraction. Past experience has taught me I need a few instructions to get things up and running so I collected my flowchart and the 5 remotes. I can hear you ask, “Why on earth would you need 5 remotes?” I can’t give you the answer to that but I can tell you I probably do. There is the TV remote, the Set Top Box remote, the DVD player remote, the VCR remote and the “Let’s get it all together remote”. Working my way through the flowchart I switched on the TV at the blue button, that should be it shouldn’t it? Well, so far so good, the screen came on but then came the message, “no signal”. Back to the flowchart and the little carrier of remotes. I did manage to set the picture size, something the TV can never remember how to do but that’s about as far as I got. I couldn’t get to choose AV3 or get any sound. Luckily for me the little one was still engrossed in the bag of low tech toys so after about 15 minutes of trying to get everything working together I just gave up. 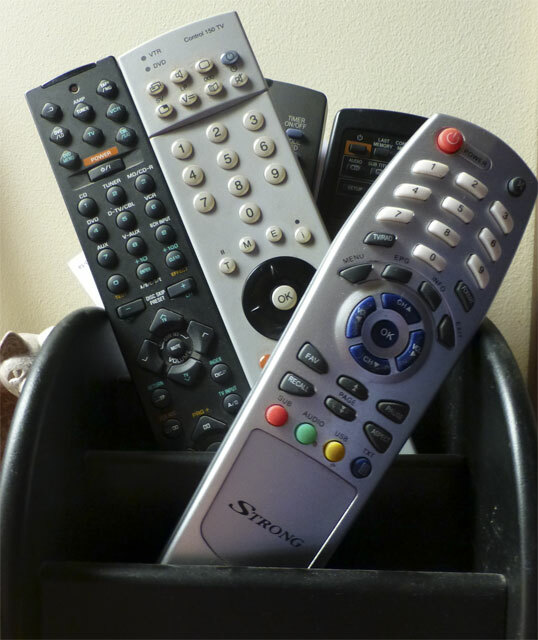 I’m really looking forward to the day they invent a TV with a little black button you press to switch it on and a clever little knob you turn which will instantly bring you the channel you want. If I’m really, really lucky it will even show programmes that leave me feeling happy, enlightened or at least just satisfied! The possibility of me picking the right one is very remote!